Get fat while traveling? No way. I’ll always go out of my way to walk at the airport while I’m waiting for my flight. That’s what The Globetrotter’s Get-Gorgeous Guide is all about. I even pack super snacks with me, so I’m not doomed to buy the snack fare on the plane, which is usually filled with fat and calories. 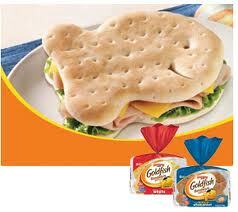 That’s why I took the bait when I saw the new Pepperidge Farm Goldfish bread! The much-loved cracker – loved by kids of all ages, I must say – has morphed into a wonderful bread that’s a delight to add to your shopping cart. Take the honey whole wheat, for example – and please do. There are 16 adorable slices per package, and each slice has just 50 calories, with no high-fructose corn syrup. They also contain fiber and whole grains. 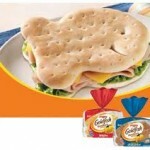 I love to eat these fish-shaped slices, with some low-calorie Laughing Cow cheese wedges, hummus, or lowfat PB2 peanut butter. Pack these into your carry-on and your thighs will thank you. These new sensations also come in various varieties such as white, whole wheat, and 65-calorie-per-slice Cinnamon and Brown Sugar. All are a great choice if you are watching your weight, especially when on the road. I fell for the new Goldfish bread hook, line, and sinker. I’m So Sweet on Torani Sugar-Free Syrups!